This week’s Virtual Recipe Club (VRC), brought to you by Biscuit Girl at You Gonna Eat All That?, is themed “potatoes” (in honor of St. Patrick’s Day?). 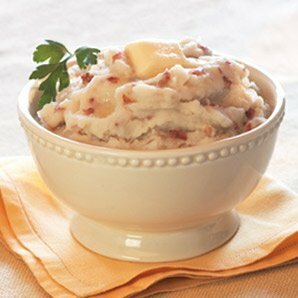 I have an infallible mashed-potato thing I make, but in the post-Atkins age we live in, mashed potatoes, a once-frequented side-dish, are now a rare indulgence. That said, don’t expect me to try and healthify this recipe. I mean, no matter how much butter and salt you leave out of mashed potatoes, they’re still simple carbs and they’re still bad for you; and if it's not made of potatoes, well, then, it's not mashed potatoes, is it? So I say, if you’re going to go for it, go for it. The only other thing I’m going to say about this recipe is that it was the only Thanksgiving item there weren’t leftovers of this year. Yes, I know, I’m awesome. Fry bacon until crispy. Crumble and set aside. Reserve drippings. Peel potatoes, leaving little scraps of peel on for flavor and texture. Cut into small, equal-sized pieces and bring to a boil in enough water to cover them by one inch. Simmer 10-15 minutes or until tender. While potatoes are simmering, sauté leeks in bacon drippings over medium-low heat, about five minutes or until soft. Pour off excess grease. Drain potatoes and return to pot. Cook them over moderate heat while shaking the pot for 30 seconds to let any excess liquid evaporate. Add butter and mash. Add milk and cheese; combine evenly. Fold in crumbled bacon and leeks. Add more milk if necessary; salt and pepper to taste. You're right about the Thanksgiving dishes, but you'll have to admit we have some other great cooks in the family. You should tell everyone about ‘the summer vacation cook off’! I think your (much older) siblings goaded you into your high standards of cooking… you being the baby and all. Yeah, you’re pretty awesome; it’s no wonder I can't loose a few pounds. Anyway, I will vouch for the potatoes; any variation on this recipe would be wonderful. Personal note: I liked the "about me" box with picture, at the top of your blog a lot better than at the bottom. Made me feel like you were talking to me each time. You are getting further and further away from anyone seeing you at the bottom of the page. Just a suggestion. Personal reply - that's a setting on your browser, not an adjestment I made to the blog. Try closing your favorites window! How can these not be good with thoughs ingredients! Great entry! I can see why you have leftover problems (meaning none leftover). Have you tried using Yukon Gold potatoes? They're my favorite for mashed. You know, everybody in my family likes Yukons, but I find them a little grainy when mashed; weird texture. I'm a russet girl through and through (oh, and I really like the purple ones! ).